There was something about editing I didn't understand for a long time. I even read James Scott Bell's book on Revision and Self Editing, and still didn't know there was a difference. I thought they were different words for the same thing. Then, in my essay writing class, the teacher handed out a paper. 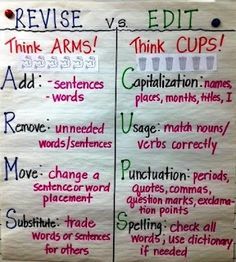 It illustrated the arms and cup method to revising and editing. Suddenly, I realized the difference. Maybe you already knew this, but if not, I found this incredibly helpful. Add--for novels, this means adding scenes, characters, plot lines, or chapters. Remove--throwing out scenes, characters, plot lines, and the like. Move--rearrange all of the previously mentioned items. In the end, revising is still writing. You're changing and shaping the plot and your characters, but editing can be done by you. It can be done by anyone with a red pen who's read The Elements of Style or the Chicago Manual of Style. Editing makes you look more polished, but it's not about the actual stry, it's about the individual words. Thanks for reading! Hope you have a wonderful week. Like you, I never realized the difference between revising and editing. This definitely was helpful, thanks! So glad to be helpful! It really helped me to see the difference too.